Well, I’ll tell you. 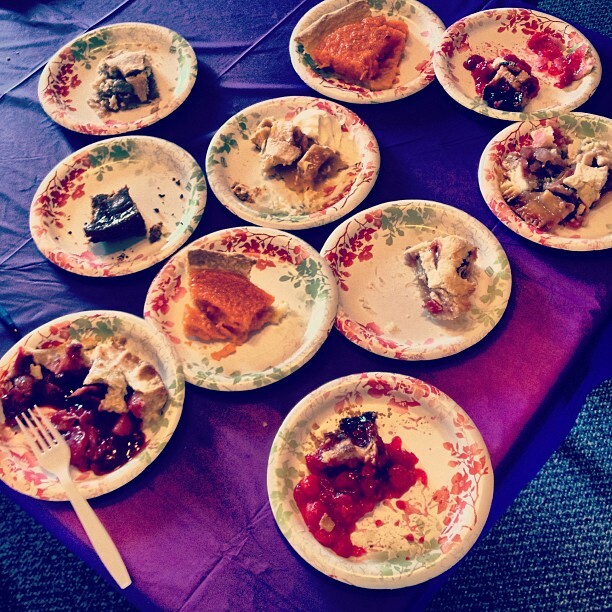 The Ann Arbor Civic Theater asked me to be a judge in their first pie competition this past weekend. I was a judge in their chili cook-off last February, and found them to be such fun and lovely people. I mean, anybody who is all like “let’s raise money for theater with the power of food…hey, wanna come talk about it?” is on my side. Yes, I did reuse my fork. And yes, I did wonder if that would compromise flavors. And no, it didn’t. And yes, I’m sure you weren’t wondering about that. It was fun! I ate somewhere between 8-10 different pies that day, none of which I had made. It’d been quite awhile since I’d eaten a homemade pie, created by hands not attached to my body, which made the whole deal rather exciting. I didn’t speak the same language as these pies. Or maybe less “speak their language” and more so “we don’t recognize each other’s voices.” Like a pet, y’know? I can’t quite talk to a dog (god, I wish I had a dog), but if I get to know a dog well enough we can understand each other’s signals, and get them to do that really cute thing where they roll around because they want a treat and stuff, and I’ll do the nice thing where I take them outside to play in the sunshine because they asked. My name is Theresa and I’ve never owned a pet. But yeah. These pies and I were strangers. I could talk to them and poke them like I do my own pies, but they didn’t respond much. I had to actually EAT THEM to get to know them. I mean, I look at any pie and immediately form opinions on whether or not I think it’ll be tasty (and then be proved right or wrong upon eating). Commercially-produced pies are usually easier to assess. Like “whoa! that might be good!” or “that looks like ground up chalk pieces hanging out on top of some fruit roll-ups!” But home-made pies, especially the pies made by bakers that have been baking ONE particular pie for a very long time, are creating many mysteries. There are stories for the choices they’ve made (though they may not realize it). The guy who won I didn’t think was hard to pick out. There were three pies that I thought were pretty cool, but his was a very cool pie. Perhaps, I am biased toward rhubarb (he made rhubarb pie), but the guy was the only person who made a lard crust, and I really thought he nailed it. And cardamom in the rhubarb? It was great! It didn’t stick out like a sore thumb AT ALL. It blended in beautifully, and didn’t distract from the allowed healthy punch of rhubarb, and then he bookended the whole thing with a crumbly pig-crust. Thom Johnson, winner & creator of Ba Ba Ba Rhubarb, on the left. 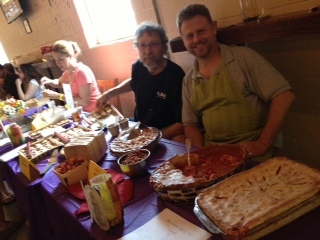 Rob Roy, right, took the People’s Choice with Ma Cherie cherry pie. I’ve never been in a pie competition; I just audaciously began making pie and asking people to eat it/bringing it to parties/shoving it down throats/trampling into my neighbor’s house at night, drunk, with said pie. I imagine a pie competition like this would be nerve-wracking just for how personal it is. You’re telling people that this is the best pie you make. This might not be the best execution, but that would only be by accident – you MEANT for it to be your best. And you’re doing this because you want some stranger to tell you so. And it really is a kind of magic when people tell you that the series of actions you just did with your body that resulted in nourishment for their body for the exchange of money was really…quite delicious. But, like everything in the world, it gets less weird eventually. The magic hits you less and less, and then only by surprise once in a very rare while. It’s just food, after all, dammit. Anyway, I’m trying to not expose my creepy, esoteric food-musings in every single post, so I’ll leave it at that. Specialty food item competitions, eh? I love ’em! Support your local theaters, folks.